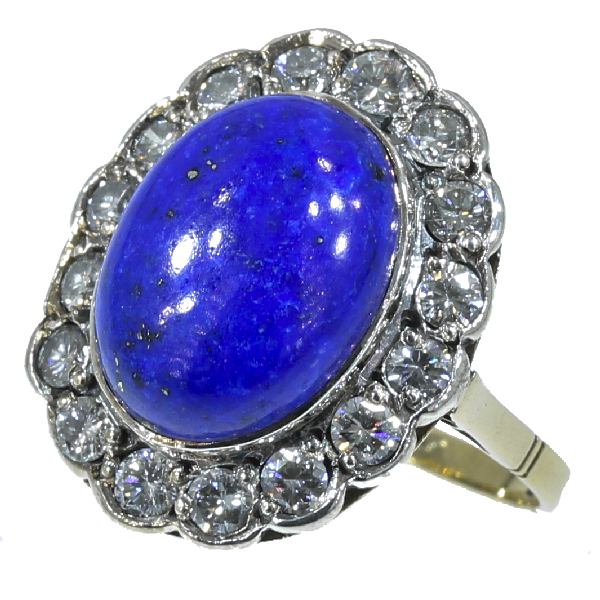 Estate engagement ring with diamond and lapis lazuli lady di style: Description by Adin Antique Jewelry. Technique: Gold-backed silver or the silver on gold technique. This technique finds its origin centuries ago, when jewelers believed that only a silver mounting could render the true beauty of a diamond. Backing the silver jewel with a (thin) layer of gold was a practical precaution taken to avoid the silver jewelry leaving black stains on clothing or skin. Over the years, with the recognition (and thus use) of platinum as precious metal and the development of white gold the practical necessity to use bi-colored material became obsolete. The argument to use bi-colored metals became more an estetic then a practical one. Lady Di ring - Princess Diana's Engagement Ring - In the early 1980s, no single piece of jewelry represented a fairy tale romance more than Princess Diana’s engagement ring. The Princess of Wales had captured the public’s heart, and her exquisite taste in fine gems became an icon for the royal feeling every bride wants on her wedding day. Diamonds: 16 brilliant cut diamonds with a total estimated weight of approx. 1.04 crt. Total diamond weight: approx. 1.04 crt. Birthstones: Diamond is the birthstone (or month stone) for April and lapis lazuli for September.